Protect your Present. Secure your Future. The CyberStrong Platform's breakthrough technology augments and enhances every element of your cybersecurity program strategy, posture and potential. CyberStrong empowers C-Level executives and operational teams to implement automated, intelligent cybersecurity compliance and risk management. Manage, measure, and report on cybersecurity as a true business function. Eliminate confusion about unknown security risks, priorities, and ROI. Clearly communicate an integrated risk management strategy to the Board or Executive Management that ensures you’re building a secure foundation for business growth. 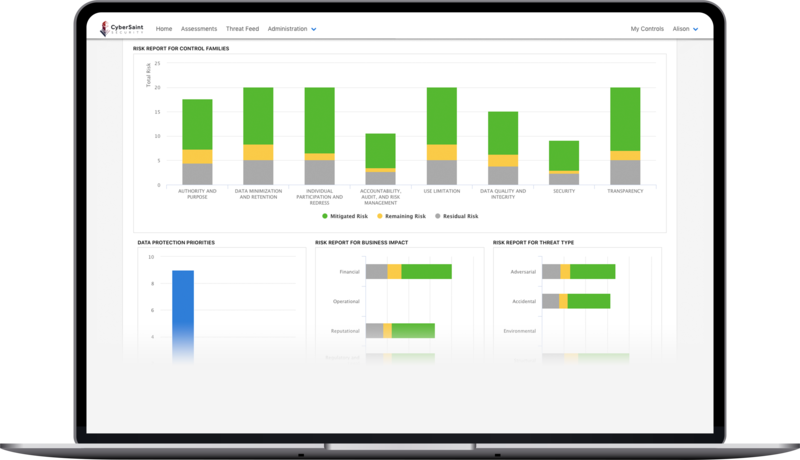 Automate the manual processes that waste time and resources during compliance and risk projects. Demonstrate program agility and success by using credible data to back up program measurement, progress, and prioritized next steps for the best return. Speed up GRC activities while making them more impactful, efficient, and effective. "CyberStrong provides me with a means to effectively measure and communicate our overall compliance posture, AI to model my security investments for the best ROI, and information on risk exposure using an industry standard model paired with innovative technology. Bright Horizons management can now evaluate clear gaps and work with my team to manage risk across the enterprise." "It was a pleasure to deal with the team at CyberSaint. They are experts in the security field and excellent to work with. They took what seemed like an insurmountable compliance project and broke into a simplified and actionable plan that eventually led us to compliance." "It’s the single source of truth for compliance and risk management, as we have very large customers and highly regulated industries. If we didn’t use this platform, we would waste large amounts of time. It would take us a lot of time to not even have half of what the platform provides, and we'd be using spreadsheets and manual processes. It works very well." Eliminate duplicated effort and never score the same control twice. From smarter insights to smarter actions, CyberStrong's Artificial Intelligence and Machine Learning technology automates, augments, and enhances every element of your cybersecurity program strategy, posture, and potential. Built upon the NIST Cybersecurity Framework, CyberStrong is the rock-solid foundation for scaling your business securely. Have confidence that your GRC activities will only grow more efficient and effective as regulatory compliance requirements increase. 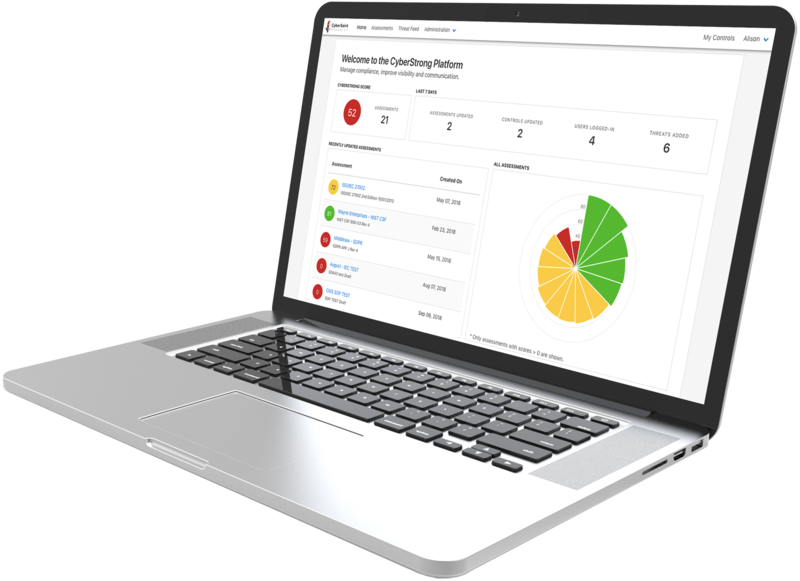 Beautifully designed with the fastest implementation available and unparalleled usability, CyberStrong automates the manual compliance and risk assessment processes making your program strikingly simple, flexible, easy to measure, and easy to manage. Cybersecurity expert thought made for security leaders, by security leaders. Read, listen, learn, and enjoy! Adopting the NIST Cybersecurity Framework can be complex. Here's a webinar for CISOs, by CISOs that covers practical steps to simplify NIST adoption. A strong reporting function is necessary for mature integrated risk management. Here are 4 executive-level risk and compliance reports that every CISO should have on hand. Know what Vendor Risk and Compliance Management functions you need to standardize frameworks such as NIST CSF and others across your supply chain with ease. Do you sell to or will you sell to the Department of Defense in the future? You must be DFARS compliant to win those contracts. Learn what DFARS is, why it's important and how you can expedite the process in this guide. Ready to see the platform that makes managing your cyber program easy?